An ordinary meal, provided you take the time to prepare it. Nor is it a mixture of “super foods” designed to prevent cancer. It is also not an extraordinary meal that requires hours of work to prepare. All it is, is a meal made at home from basic ingredients. There’s nothing magical about it, no silver bullet for anything in it; moreover, it requires a bit of time and energy to put together. a bit of coconut powder/flakes (because my wife insisted). These ingredients don’t come from our garden (not yet), but some (the beets and green onions) were purchased at a local farmers’ market. We are lucky to now live fairly close to one, and of having the free time to go buy stuff there. Actually, come to think of it, it is not a matter of having the free time to go: It is the desire to take the time to go. It is about resolving not to let easier ways, and the illusion of being short on time, take control of our lives. That’s the real message of this post. And it is a topic I’ll re-visit in the future. Final ingredient? Home-made mayo. That’s a habit we have taken recently, and it is highly satisfying. We know exactly what we put in our mayo. 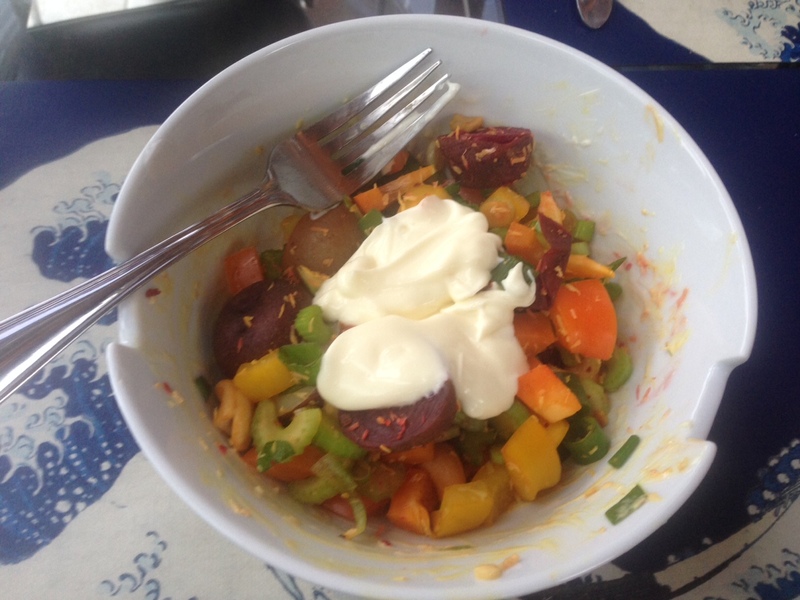 But if you are not sure about making mayo, you can always use ordinary olive oil and a bit of balsamic vinegar. 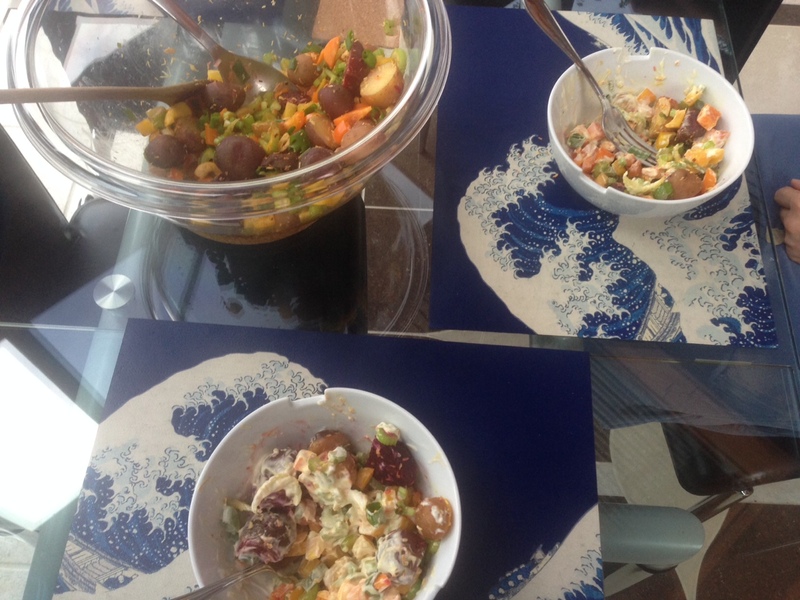 We happen to think that such a “potato and beet salad” goes better with mayo, and because it is meant to be mostly made from scratch, it should be home-made mayo. As a matter of fact, even the home-made mayo only requires a few minutes to make. Really. Therein lies the drama of our modern existence: We are told, and we tend to think, that making food from scratch requires a lot of time. It takes time, but not that much. Instead of reading the paper, or watching TV, or worse, reading silly stuff on Facebook or the Web about what “famous people” have been up to lately, we can find better uses for our time. Before I forget, you have to steam the potatoes and beets before using them in the salad. I use a little steamer, and that pretty much dictates the quantity of potatoes I put in, once the beets are cubed and in the steamer. Let them cool down before mixing them in with the rest of the ingredients; you can steam them a day or more in advance, while doing something else, or use the cooling-down time to chop the rest of the veggies. The mayo can be made while the potatoes and beets are being steamed, or hours or even days in advance. I think my wife added a few spices (some salt, hot pepper flakes) while my back was turned. That’s to taste (and I never question hers). Go ahead, take some more. It’s all good. So, this is not an extraordinary meal, and this post is not a recipe. Not quite. But it is good food, so you are welcome to seconds, and you don’t even need to think about the calories. Because when it goes through “the other end” after anywhere between 12 and 36 hours, you will notice.